It seems whenever I have time to sew, something happens to get in my way. This time it was my beloved Bernina. She decided to have a bad day, be surly and uncooperative, and I was tearing my hair out. Nothing serious, (I hope) but four hours later I made an emergency call to my favorite Bernina technician in Kansas and she talked me down from the ledge. My baby will have to go in for a check up. I decided I liked Scandia Crush so much I made it bigger. It was fine for a class sample, but I wanted to be able to give it away as a baby quilt and I don't like tiny baby quilts....bigger ones are useful for so much longer, so I made more blocks until I ran out of the gray Heath fabric. My friend Kate brought me over a couple of yards of this Finlandia fabric from her secret stash for the back! Perfect! Since I decided to let my Bernie rest, I did a bunch more cutting. 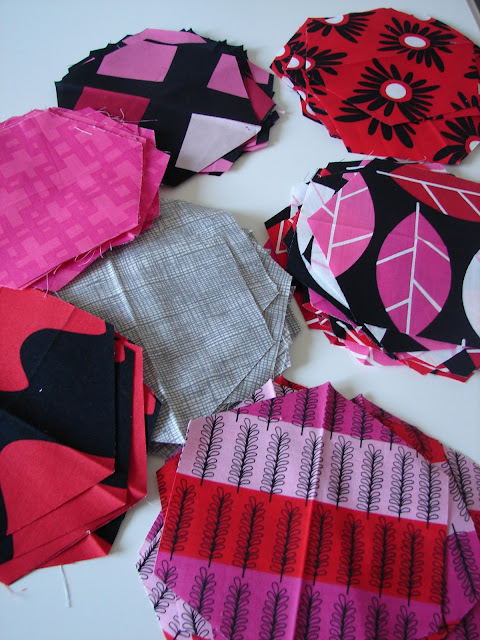 Look at all these hexies....more Stockholm....can't get enough of that fabric! I basted a couple of quilts from the closet too. Now I really need my machine! I hope it is just a little tune up and she's back with you soon. I love you Scandia Crush quilt! I hate machine problems! my machine always acts up when there is a deadline involved sooooooo it has been pretty crabby of late while I a trying to finish quilting some quilts so that I can bind them while I am on vacation...yesterday I broke 5 needles, yep, she was not a happy camper! Your quilt is looking beautiful and it is good that you could finish doing some other tasks while waiting for your machine to behave :) See you at the meeting! Your quilt and the hexies are wonderful. Hope your Bernina is back to her old self soon. 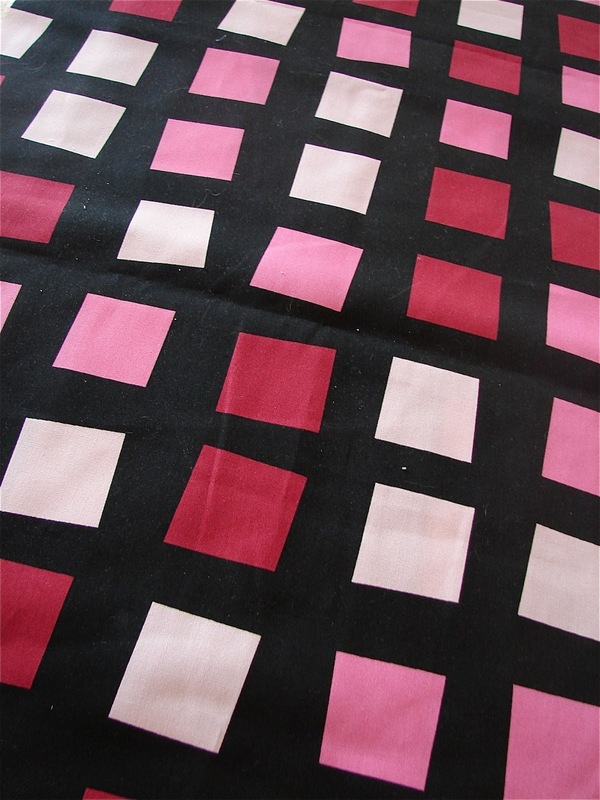 The Finlandia fabric is wonderful!! Love how you are using it too. These colors are so fun! Sorry about your machine-that is always so frustrating. Hope she's on the mend soon! That is too bad about your machine. I can understand your frustration, especially because you were working on such a great quilt! That will be some lucky baby! Also, I just adore the idea of a "secret stash", I think I need to know more . . . I am loving all the pink, red and grey! It's so frustrating to be stuck in the middle of a project. I hope your Bernina comes home soon! I'm hungry for those hexies. Looks like a bunch of wonderful pies! Very nice! That heath complements the patterns so well. What size do you like for a baby blanket? I've been struggling with this -- I'm trying to decide what to make for my sister's baby, but feel like my 3-year-old already wants bigger blankets than that size...so is it worth making something small? Have you found a happy medium, or do you go up to a twin size? I struggle with that too. A lot of folks make baby quilts very small. I feel like a bit bigger will grow with them a little more. Twin size seems too big for me, especially for a toddler to haul around. This one is 40 x 40...it has to act as a sample so much bigger won't work, but typically I make baby quilts at least 40 x 50...still works to snuggle over a stroller or as a playmat and a toddler can drag it around pretty easily. That makes sense...I'm working on one now for a friend and it's headed toward 45 x 45, because that size made the math work nicely. But I can imagine that going up to 50 for one side could be even better. 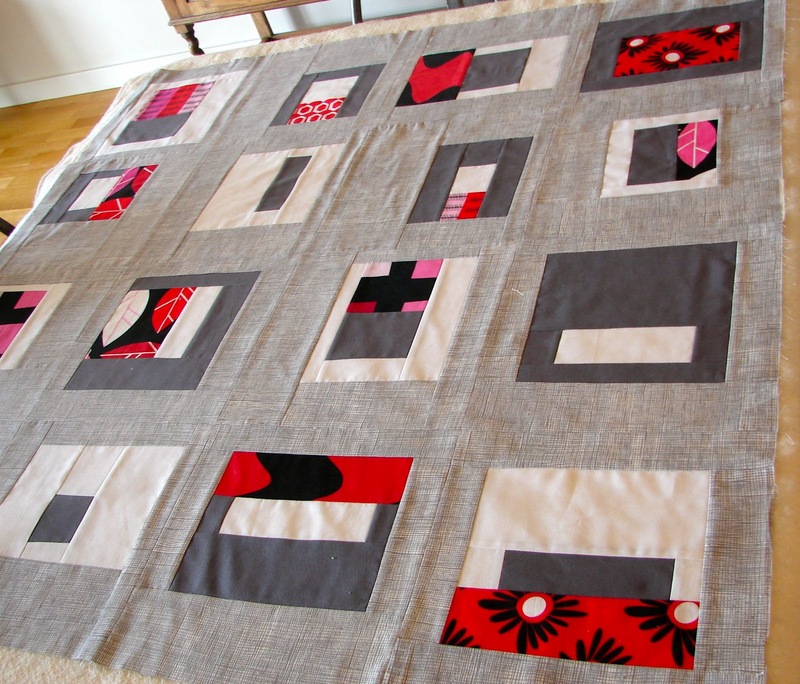 More like a kid-sized lap quilt...thanks for sharing your thoughts! I hear ya! Love how you made this quilt bigger. Such great fabrics together. Hope your machine is back to you soon. Love your quilt! I agree with you! I always make baby quilts 60" x 60" or so now. Thanks for sharing your awesome quilt! Love the pinks, the combination with grey is really nice. Hope your Bernina is "back to work" soon!! I had some drama with my Bernina last week. It was hard to be without her for a few days. We have a sort of love/hate relationship. I love when she is working well but hate the days with drama. I just want to so and she gets all finicky if I change thread or something.